Edit: a follow-up question: Restore mongoDB by --repair and WiredTiger. My developer committed a huge mistake and we cannot find our Mongo database anywhere in the server. 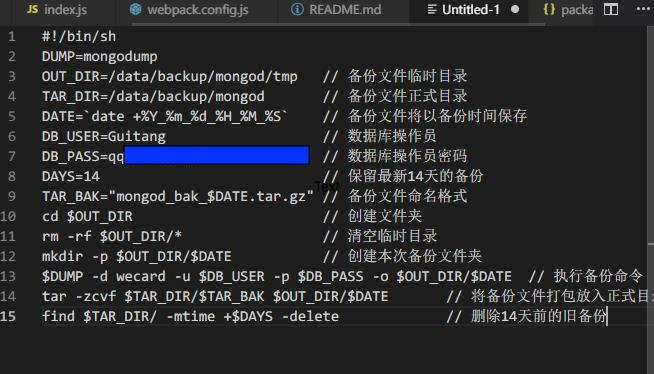 He contacted AliCloud, the engineer connected the disk to another working server so that he could check the disk. Looks like some folders are gone, including /data/ where the mongodb is! And of course, is it possible to get the /data/ back? PS: He did not take snapshot of the disk before. PS2: As people mention "backups" a lot, we have lots of important users and data coming these 2 days, the purpose of this action was to backup them (for the first time), then they turned out to be entirely deleted. Easy enough. The // sequence isn't a comment in bash (# is). The statement OUT_DIR=x // text had no effect* except a cryptic error message. Thus, with the OUT_DIR being an empty string, one of the commands eventually executed was rm -rf /*. Some directories placed directly underneath / weren't removed due to user not having permissions, but it appears that some vital directories were removed. You need to restore from backup. // 备份文件临时目录   # shell error as `//` isn't an executable file! 1) He erroneously assumed that // was a bash comment. It is not, only # is. The shell interpreted // text as a normal command, and did not find a binary called //, and did nothing. In bash, when you have a variable assignment (OUT_DIR=/data/backup/mongod/tmp) directly preceding a command (// text), it only sets the variable while running the command. Therefore, it unsets OUT_DIR immediately, and when the rm line is reached, OUT_DIR is now unset, and rm -rf / is now called, deleting everything you have permission to delete. 2) The solution is the same as all rm -rf / cases: restore from backup. There is no other solution because you do not have physical access to the hard drive. 1) Bash comments start with #. Sorry for your loss. 2) Restore from backup is the only way to proceed here, unfortunately. Not the answer you're looking for? Browse other questions tagged filesystems shell ubuntu-14.04 data-recovery disaster-recovery or ask your own question. Accidentally formated external usb harddrive (500GB) with bootable iso (1GB), how can I recover my data? Accidentally rm -rf /usr/* as root, what now? How to add a timestamp to bash script log? Synology: How to restore data from an accidentally deleted volumeX (BTRFS)?